Previous post: What to see? I’m teaching a workshop on the creative process this weekend, and it occurred to me that I should probably work through the exercises in the workshop beforehand, to identify possible snags and to provide examples to the students. Also, I need to write up handouts for the class. Cricket loom, warped and ready to go! It’s a Schacht Cricket, a rigid-heddle loom which is small and eminently portable. I turned to it out through a mix of curiosity and desperation – desperation because I needed something that would be super-quick to set up, and curiosity about rigid heddle looms, which I (along with many other multishaft weavers) have generally regarded as a toy. The purpose of this particular workshop is to teach a process for coming up with original designs – starting with a period of free exploration – trying different materials and techniques just to see what happens, and recording the results in an “idea book”. From there it moves into generating ideas, then generating designs from those ideas, and finally into critiquing and improving your own designs. 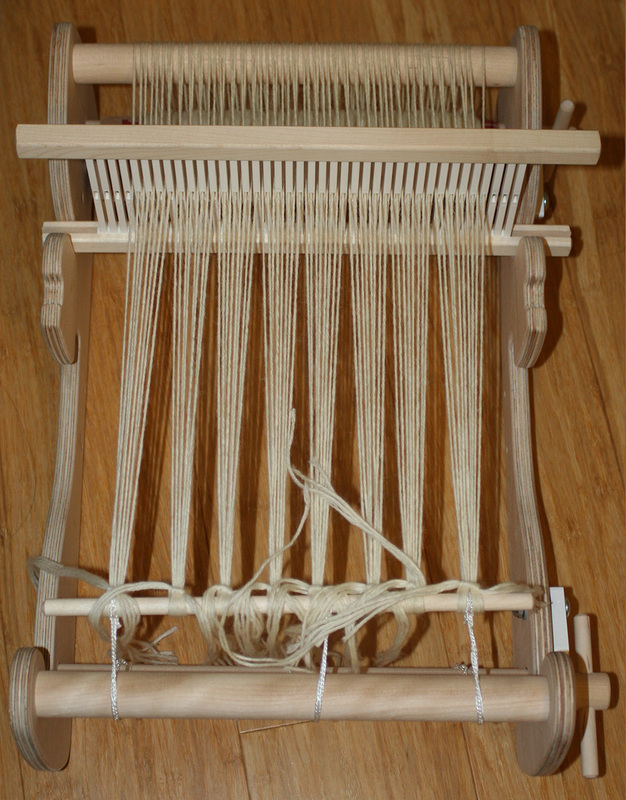 This is something that can be done with virtually no tools and in just about any medium – and to illustrate, I’m turning to a very simple loom, the rigid heddle. I had intended to do my examples on a table loom, but realized that it would take far more time to set up a table loom than the Cricket, and the table loom is much bigger and heavier – a major consideration since I am also lugging an astonishing array of classroom supplies to the workshop. Also, I liked the idea of demonstrating that creative work can be done with very simple tools. So I will be weaving an “idea sampler” on the Cricket over the next few days, and putting together an idea notebook based on the sampler. It should be interesting! I have also made progress on the next Phoenix Rising sample warp – I redyed the pattern warp and put both pattern and ground warps onto the loom on Saturday, with help from a fellow weaver. I’m a bit worried about the pattern warp. Because I had to dye it a second time, it had some problems with tangling – but this time, I left the raddle lease sticks in, and worked the tangles back through the end of the warp with the lease sticks. Despite my best efforts, I think there are still some minor tension differences in the warp, but I am NOT NOT NOT going to wind and dye a third set of warps, so I will forge ahead and hope it all works out. I figure that at worst I can advance the warp a few yards, since the tension differences started out minor and got progressively larger towards the end of the warp. I also need to write more posts for Creating Craft. I’m about a week and a half ahead at this point, which is not nearly enough considering that I also have to prep for and teach two workshops on back to back weekends, while working full time. I do have next Monday off (it’s Martin Luther King, Jr. Day, which is a Stanford holiday), so that will help. Somehow, I’ll manage to get through January. Hopefully February will be less hectic! Have fun with the class and the cricket –looking forward to reading about it!